Sitting too much — whether at work, in the car or at home — can have serious health consequences. People who are more sedentary are at a greater risk of some cancers, such as breast and colon cancer, and may actually be taking years off their life. The easiest way to combat the negative health effects of sitting and increase your overall fitness level is to move more. If you spend the majority of your day sitting at your desk at work, finding ways to be more active is critical for your health. The good news is that even small changes in your activity level can make a big difference. If you’re ready to improve your health and shed unwanted pounds, try these simple ways to burn more calories during the day — no gym required. Start walking. Simply walking more is one of the best ways to stay active. A 154-pound man will burn 140 calories in 30 minutes of brisk walking. If you weigh more, you’ll burn more calories. Get in the garden. 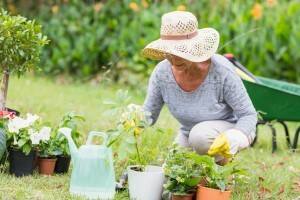 Doing yard work is another great way to improve your health. Heavy yard work, like moving dirt or hauling rocks, burns about 500 calories per hour. Raking leaves will burn about 400 calories per hour. Mowing the lawn burns about 300 calories per hour. Even light gardening or yard work, such as pulling weeds and planting flowers, will burn about 200 calories per hour. Schedule tee time. Grab a friend and hit up the golf course, but leave the golf cart parked at the clubhouse. Walking and carrying your clubs will burn upwards of 300 calories per hour. Stand more. If you spend your day sitting at a desk, try a standing desk instead. Some experts believe standing burns about 50 percent more calories than sitting, so you could burn an extra 50 calories per hour just by standing up to work. Standing also helps to increase leg strength and endurance. Clean the house. Like yard work, it has to be done. Rather than dreading the housework, think of the health benefits of keeping your home tidy. A 150-pound person can burn about 85 calories in 30 minutes of light cleaning. Exercise during TV time. Rather than fast-forwarding through the commercials while watching your favorite show, use those three or four minutes to sneak in a workout. Try a round of 20 burpees followed by some abdominal work. During the next commercial break, change it up with push-ups or jumping jacks and more ab work. Take the stairs. Always opt for the stairs over an elevator or escalator. Taking one flight of stairs burns about five calories, which can add up if you climb multiple flights a day. Taking the stairs can also help tone up your legs and glutes while improving cardio endurance. Play sports. Participating in community sports leagues is a great way to have some fun with friends while getting in a good workout. There are recreational leagues for just about any sport, such as basketball, soccer, volleyball, softball and even hockey. Staying fit and healthy doesn’t require a gym membership or expensive equipment, but it does require a mindset focused on getting physically active. Take the time to make a few small changes in your lifestyle and reap the benefits of moving more.